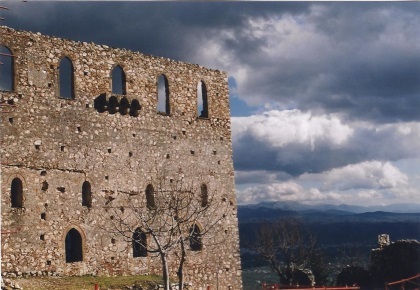 The Archaeological Site of Mystras is a relict townscape from the 13th century. After having conquered Constantinople in 1204, the Crusaders divided Greece among themselves. Small states were created. 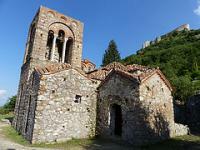 One of those was Mystras, established by Guillaume de Villehardouin. It started as a castle, but the inhabitants of nearby Sparta fled to this safe place and developed it into a city. At the end of the 14th century, Mystras was the centre of the Peloponnesus and flourished as never before. It also became an intellectual centre, where artists and writers found a refuge. 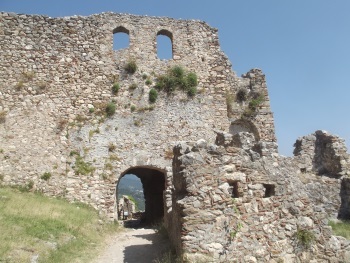 In 1460, Mystras fell into Turkish hands. It lost its grand status but remained a commercial centre where at one stage 42.000 people lived. The city finally came to its end after a fire in 1825. Mystras is the best thing I saw (so far) in Greece. The city from the Middle Ages is plastered against a mountain near Sparta. It's December, but it looks like fall: brown trees, fresh but chilly air, some dark clouds. The entrance gate to Mystras welcomes you in true medieval style: I knew at once I was going to like it here. What remains of the city are its churches, a monastery, some walls and roads. The steep, cobbled streets are mostly genuine, and give the feeling of actually walking there in the 14th century. The roads were narrow then, so narrow the edges of building were removed to leave more space for passers-by. Of course there were shops then, markets and handicraft businesses. It would be great to be able to time travel on this spot. 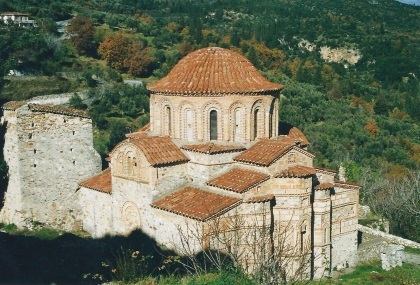 The focuspoints are the Byzantine churches of Mystras. They were restored, both in- and outside. Frescoes, with a lot of dark blue colours, have come to the surface. The red round or octagonal roofs stand out between the now brown and green trees that surround this site. You can only walk around this scenery openmouthed. 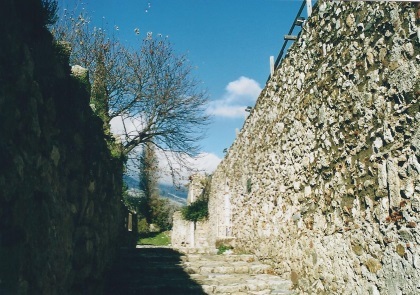 The Byzantine city of Mystras occupies a whole hillside of the Taigetos Mountains. At the summit is the defensive castle, accessed by a steep, rugged track from the Upper Entrance to the site. From the castle there are extensive view over the plains of Sparti. After visiting the castle I descended past the Upper Entrance, and continued following zig-zag paths to visit the various buildings of the Upper Town. The Palace was closed for restoration, but the nearby churches of St Sophia and St Nicholas with their colourful frescoes were open to visitors. Descending to the Lower Town I passed the Pantanassa and the church of St Theodore before reaching the Metropolis, a monastery complex including the church of St Dimitrios. Here there are many more frescoes to be seen. I visited this WHS in June 2014. The mountain scenery alone is wonderful. However, walking uphill through the main gate, listening to the cattle bells echoeing in the valley, enjoying the wonderful breeze as you go from one quaint church to the next is definitely an experience nobody should miss when in the Peloponnese. My favourite churches with the best frescoes were the Agia Sofia and the Byzantine Metropolis Church. The view from the fortress/castle above is very worthwhile even though the Palace is under restoration at the moment. From Olympia I took the bus over the Peloponnesian Mountains. Even though I'm a Scandinavian and quite familiar with mountains, I must say it was a stunning experience to drive along the slopes and suddenly find yourself in a small mountain town where the local market forced my bus to a sudden stop. Or the horror experience of meeting a fully loaded lorry on a narrow mountain road with a 300 meter sloap just half a meter outside your window. Having survived this close-to-a-heart-attach-experience I reached the relatively uninteresting town of Sparta. Some remains from an amphitheatre is about it on the archaeological menu. 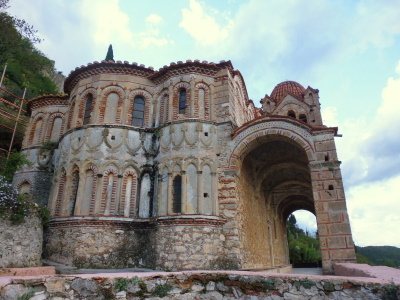 Instead the major sight is about 5 km west of the town, on a mountainside - the Byzantine town of Mystras - founded by the French crusaders and then developed into a major centre of culture and trade in the 13th and 14th century. I recommend you strongly to take a taxi as far up as you can, then climb the remaining 150 meters to the crusader castle and then take a slow walk down the remains of ancient Mystras. Small monasteries, churches and houses flanks the way down to the entrance, some 200 meters downhill. Beautiful frescos and excellent Byzantine architecture will make your day before you return to one of Sparta's better establishments for a nice Greek dinner. Today, its most obvious claim to fame rests on the (more than 12??) Byzantine “churches”, including a cathedral and several monasteries. Many have been restored and contain fine murals. These are of course “worth a visit” even for a non “Byzantium specialist” but it was the general atmosphere of calm and rural solitude which I remember. The large site provides plenty of opportunity to wonder the cobbled streets and courtyards at leisure soaking up the scent of wild flowers and looking out over the vistas of Greek countryside. Also, as I remember it, even finding “wild” tortoises (at least they were when we picked them up)! Avoid the heat of the day as it is built on the side of a mountain (photo) and there is a lot of climbing. From "Mystras" to "Archaeological Site of Mystras"